Now that you’ve chosen your gown, it’s time to get started on the ladies standing beside you. Savvi is proud to offer beautiful bridesmaids dresses for your special day. Among our high quality designers, you will find all of the latest colors, styles and trends. Call Savvi Formalwear & Bridal at (919) 783-8911 or click here to make an appointment to style the bridesmaids for your BIG day! After Six gowns are featured at Savvi Formalwear & Bridal in Raleigh, offering best selling styles at the best prices. Click here to purchase your After Six gown now. Alfred Sung is a Canadian fashion designers featuring clean, modern, timeless fashions. Come into Savvi Formalwear & Bridals to see and feel the quality, style and value. Your Alfred Sung gown is available online by clicking here. Bill Levkoff has been dressing bridesmaids for over 70 years. To their credit, their fresh, modern, millennial designers are passionate about creating fashion forward collections that capture the most current trends. A popular choice with Bill Levkoff is to mix and match styles in complimentary, but not necessary the same color. Since the 1950’s, the Dessy Collection by Vivian Diamond is a the premiere dress line which offers upscale, modern bridesmaid options. Each dress is designed with excellence in mind and constructed with specialty fabrics. To order your Dessy gown online, please click here. Introducing the Jenny Yoo Bridesmaid Collection, inspired by prints and versatility for your bridal party to mix and match as they please.Flattering silhouettes of tulle, chiffon, and lace to accommodate every member of your bridal party. Purchase your Jenny Yoo gown online by clicking here. Everyone loves a Morilee... and with good reason. 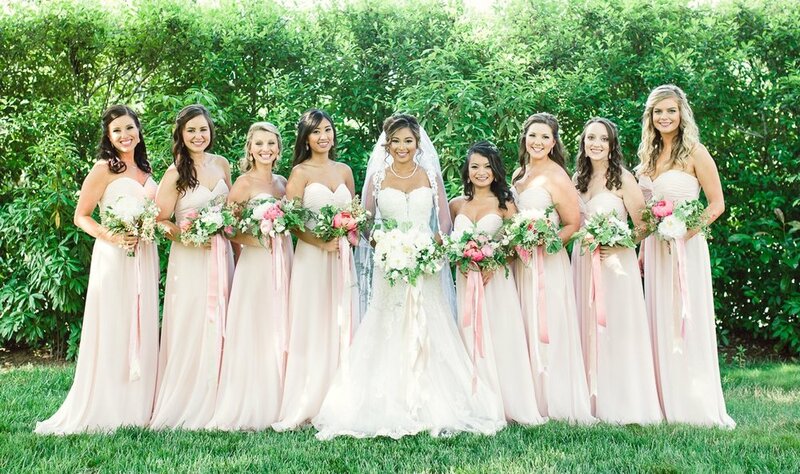 A leader in the bridal industry for more than 50 years, MoriLee offers bridesmaids dress that blend style and affordability for ladies who will look and feel amazing on the big day. The Studio Design Designer Bridesmaid Collection is available exclusively at Savvi Formalwear & Bridal. Studio Design gowns are available for purchase online by clicking here.